The sun peaked in through the opening in my sleeping bag as I heard something scavenging beneath me. I sat up in the cool air and startled the stray dog sniffing my saddle bags. I looked out at dolphins playing in the bay…where am I?!? 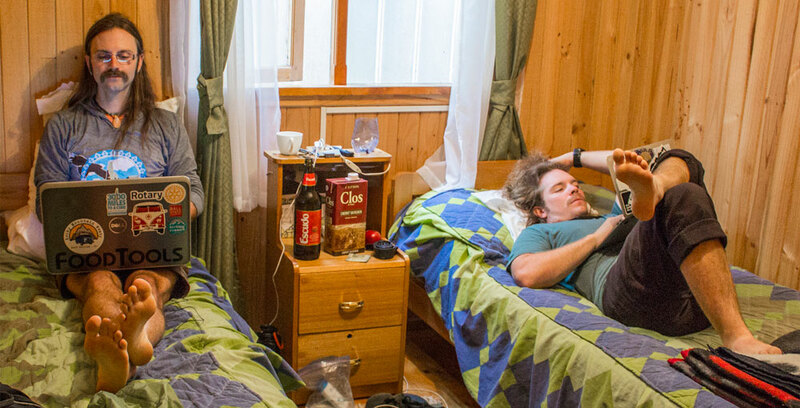 Ryan and I arrived in Puerto Montt, Gateway to Patagonia, after an 8 hour overnight bus ride. It was 4:00 AM, too early to do much of anything other than sleep, so we stumbled out of the bus station and procured a couple of park benches for a few more hours of rest. Once awake, we scouted around town for some WiFi, the only option was Subway, before hitting the road. Back on the road the dream we had of Patagonia started appearing before our eyes. 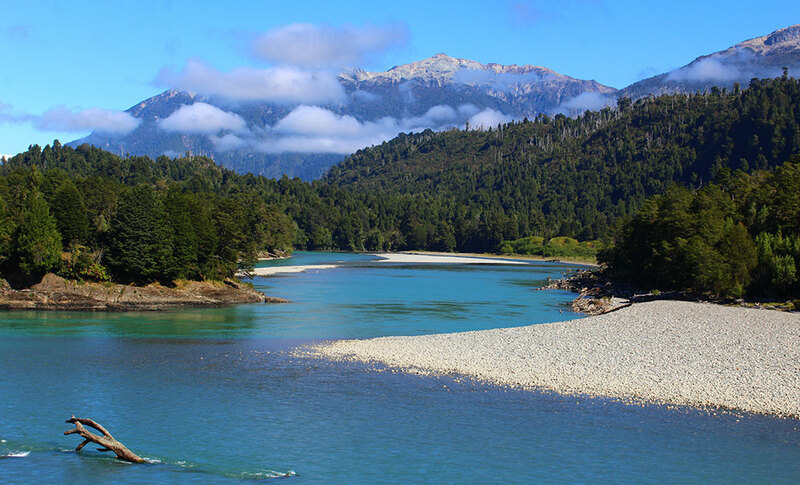 Our first days in Patagonia included several boat ferries to follow the iconic Carretera Austral. 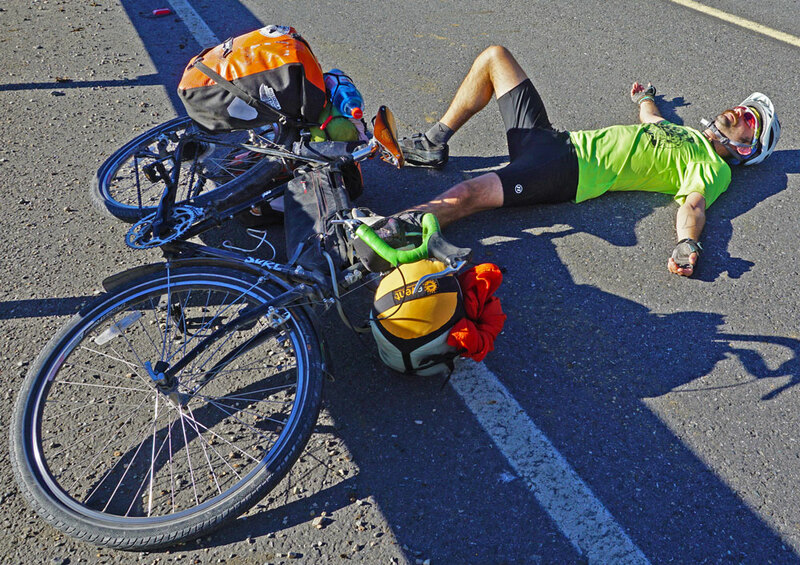 One stretch even required us to find a truck to load the bikes from one ferry to the next. Our Spanish was still not up to par and after being laughed off by one driver we thought we’d risk riding instead. Luckily, a Peruvian born North American friend we just met found another driver willing to haul our bikes, and thank goodness he did. I’ve seen less bump drafting and jockeying for position in a NASCAR race than we witnessed on that 7 KM stretch of ripio (gravel) road to the next ferry. In Patagonia ripio roads are gravel roads that could be anything from rutted out dirt roads to covered with golf ball sized river rocks. I was definitely not a fan. Ryan bombed down the hills while I smashed on the brakes, but most of my falls occurred riding uphill when my back wheel slipped, causing my forward momentum to succumb to gravity. That being said, I didn’t only fall on the ripio roads. 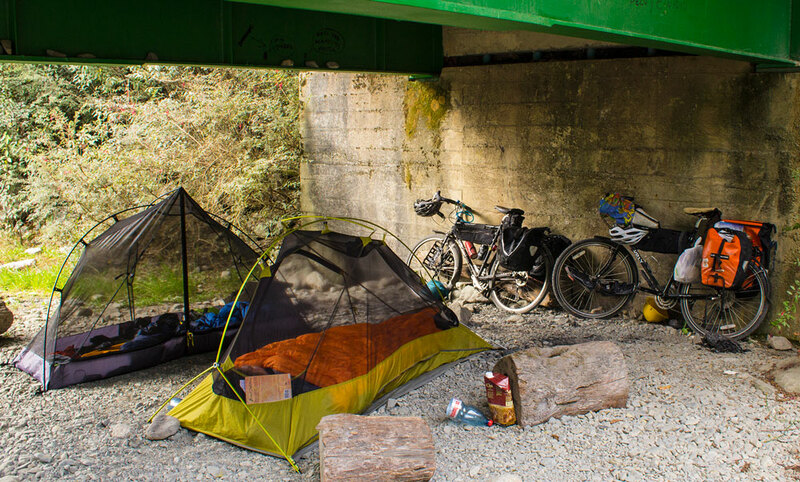 In bike touring there are ups and downs, and I definitely preferred the ups. The terrain along the Carretera Austral was breathtaking. From rocky and rugged mountains to the top of the world glaciers feeding translucent tortoise rivers, every turn revealed more of Patagonia’s beauty. We were also blessed with incredible weather, save for the 2 days of rain when we holed up in a hostel and I got some work done. Part of my agreement with Ryan was that I’d be able to work a day or two of each week along the way to keep my income flowing. In the photo below I was working while Ryan scouted our next international adventure. 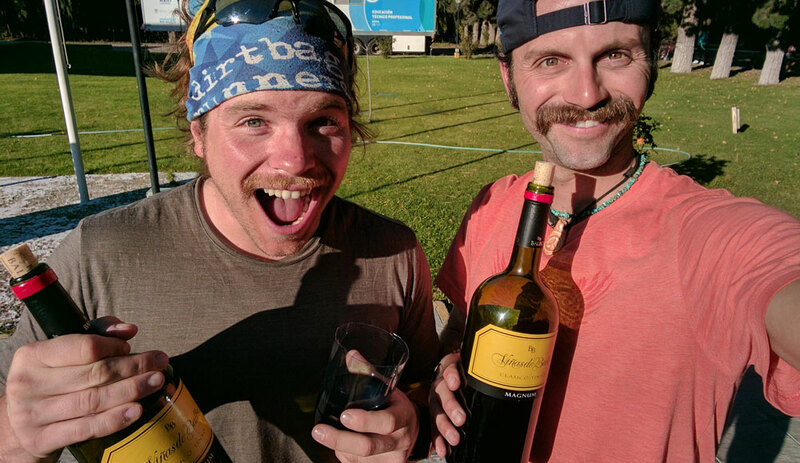 For better or for worse, we learned early on that 2 liter boxes of Chilean wine were delicious and only cost a few US dollars. We promptly added them to our daily diet, stopping in small tiendas each afternoon to acquire our daily ration of fruit, calories, and pain killer. 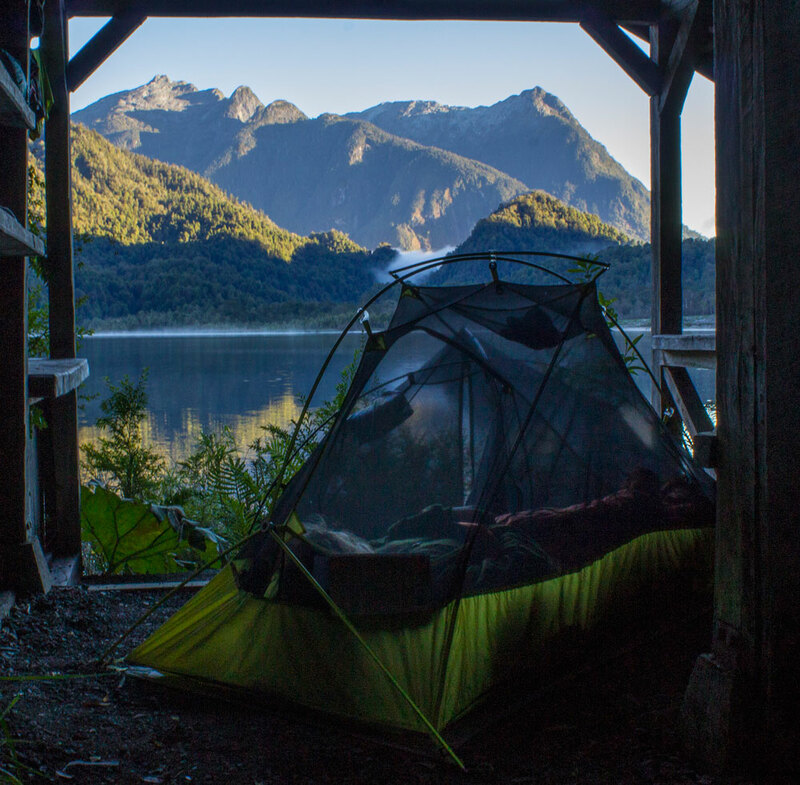 Our stealth camping had vastly improved since the first few nights in South America, and Patagonia offered the pinnacle of campsites. 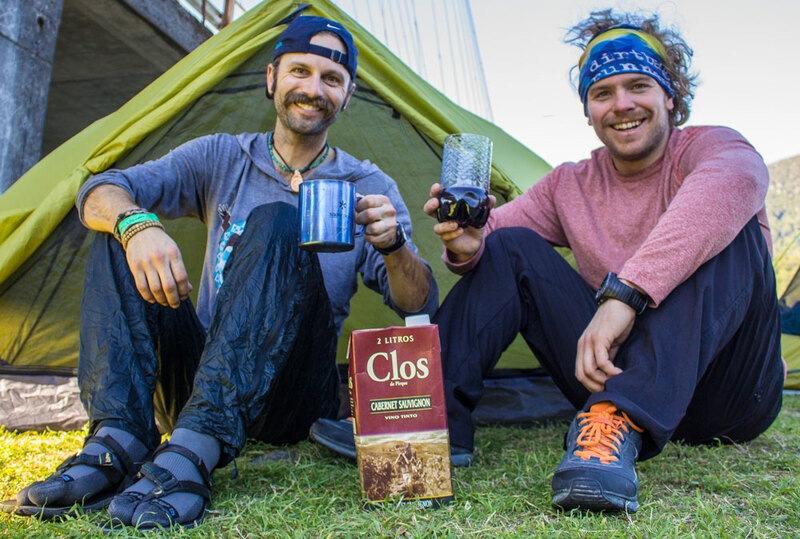 We stopped in hostels, or cabañas, at least once a week to shower, recharge batteries, and work, but boondock camps included picturesque river banks, beach camps, and stunning mountain views. Of course, we still had some “not so scenic sites” like this one under a bridge. We were having a blast on the Carretera and would have liked to cover the entire length to Villa O’Higgins but we were so late in the season that the ferries were sporadically running. 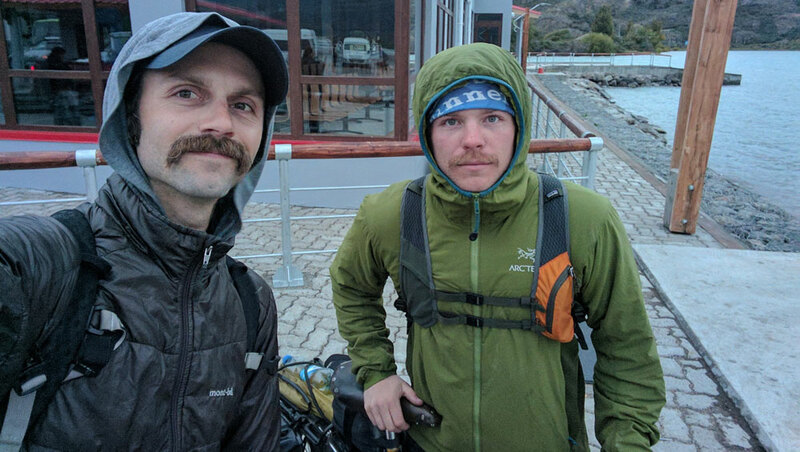 We didn’t want to get stuck so we opted to bus from Coyhaique and ferry to Chile Chico and then bike into Argentina and catch another bus to El Chaltén. Once in Argentina we purchased overnight bus tickets and meandered around town for the day. Following the afternoon siesta we found a store to buy a bottle of wine and followed that up with a few more bottles of wine. By the time the bus departed that evening I was good and lit and we were on our way to Patagonia Part 2.